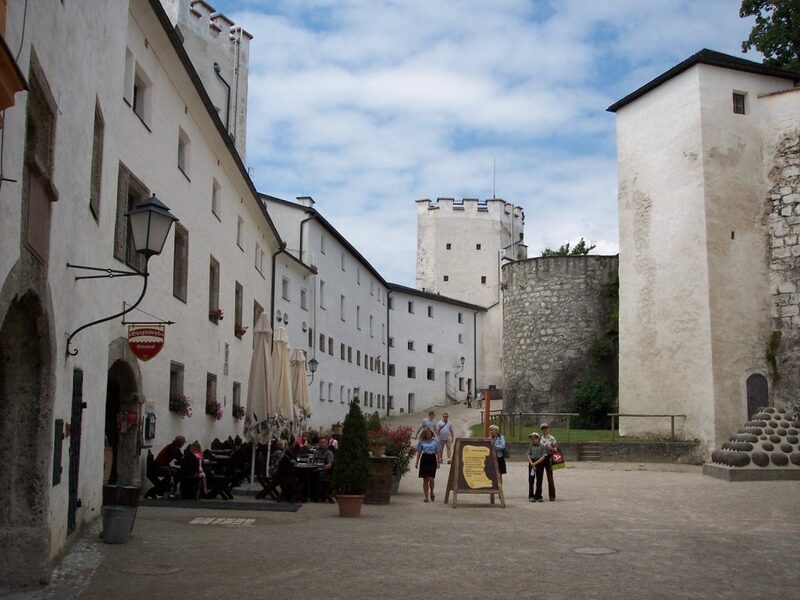 The towering Hohensalzburg Castle is among the most magnificent of Austro-Hungarian castles. 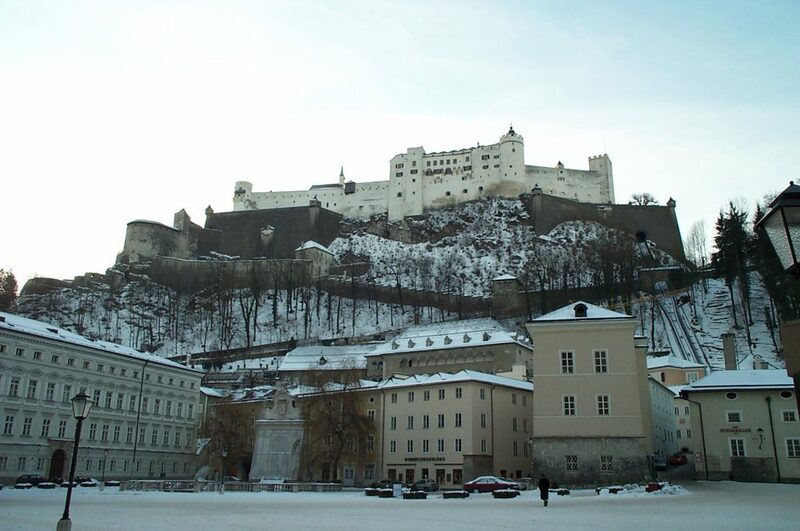 Brilliantly white and standing very high over the city, it provides a spectacular view of Salzburg’s Altstadt and the Salzach River valley. More than just a monument to Austrian history and major-league tourist attraction, it has a concert hall and hosts specialty markets during the year, making it one of the must-do’s for visitors. But, there’s a lot more to the hill than the castle on top of it, as I found out. If you are physically able to make the climb up the inclined walkway, there are several things to see and do in the side of the cliff that you would miss if you took the funicular railway from the downtown. So this chapter of Salzburg covers the castle, the catacombs above St. Peter’s, and St. Peter’s cemetery that resides against the cliff. The first photograph above shows the Castle from downtown. I do not precisely recall from which square this shot was taken, but it was taken very early on a wintery Sunday morning as I was on my way to Mass in the Salzburg Cathedral. The tracks of the funicular railway can be seen at the right — look for the hold within the right side of the gray-colored main wall and follow the parallel lines downward. There were two ways to walk up to the castle, a shorter direct way visible across the front of the castle in the above photo, and a longer way that follows the mountains off the photo to the right. I climbed up to the Castle by the first route, which provided a number of different views of the city. But, one intriguing sight came upon me at roughly the halfway point. 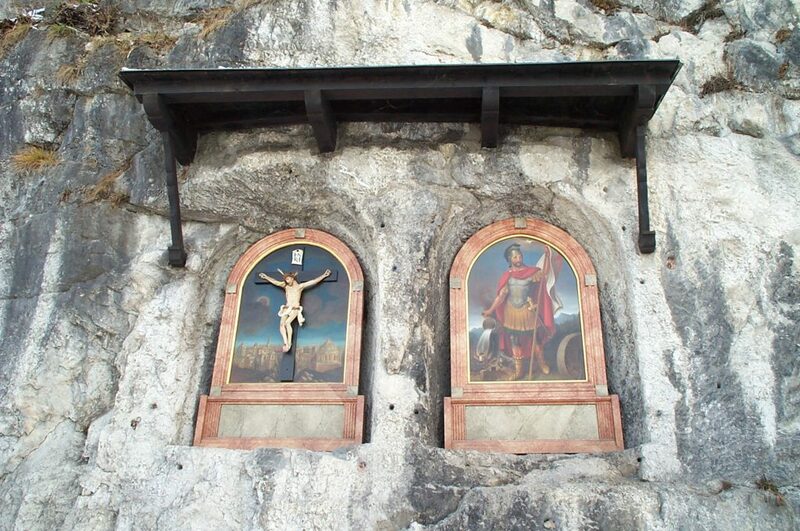 It is shown in the second photograph above — a pair of artworks, one of Jesus Christ and one of a warrior or leader. At the time of this photo, there were no inscriptions, but I have to assume the painting at right regarded one of the earlier lords of the castle. Once inside the castle grounds, I continued to climb up to the main inner courtyard, shown in the above photo. I found the walls brilliant white and the courtyard very large — plenty large to host huge events. In fact, the huts from the Hohensalzburg portion of Salzburg’s big and famous Christmas Market were still in place and not yet disassembled. There was a chapel built into one wall and main restaurant and concert hall not far away. Based on the brochure I read there, the concert hall was used during the city’s annual Salzburg Festival (sometimes referred to as the “Mozart Festival”) in the summertime and for Christmas and New Year’s concerts as well. Alas, I did not have time to take in an interior tour of the castle (a must-do should I return), but had plenty enough time to take some scenic photos of the region. One of my all time favorite winter shots is shown in the fourth photograph below, facing south toward the Alps. The little tiny dots on the lower left are actually people sledding, which gives you an idea of how high up this is. I also took plenty of shots back to the north toward Salzburg, some of which are available in the Altstadt chapter of this travelogue. I ventured down the ‘other’ path toward St. Peter’s, taking more shots of the city as I went. Along the way, I encountered the catacombs directly above the cemetery and built into the wall of the cliff upon which the Castle resides. The catacombs is preserved as a museum costing only a Euro or thereabouts as I recalled. The next photograph was the only picture I took inside the catacombs, unfortunately, because my camera at the time did not handle dark areas well (it was a circa 1999 digital camera, after all). 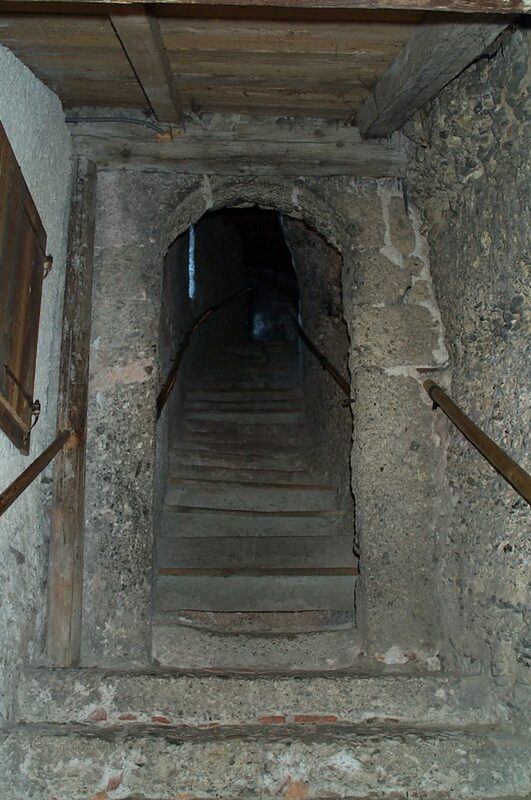 The photo shows the entranceway, a steep climb up the inside of the cliff. To get your bearings, the outer wall of the cliff is the left wall in this photograph. The catacombs were pretty much emptied out, but some tombs remained in a couple of the chambers, and the maze of chambers was interesting to walk through. St. Peter’s Cemetery (shown snow-covered in the next photo and during summer in the last photo), awaited at the bottom of the hill. 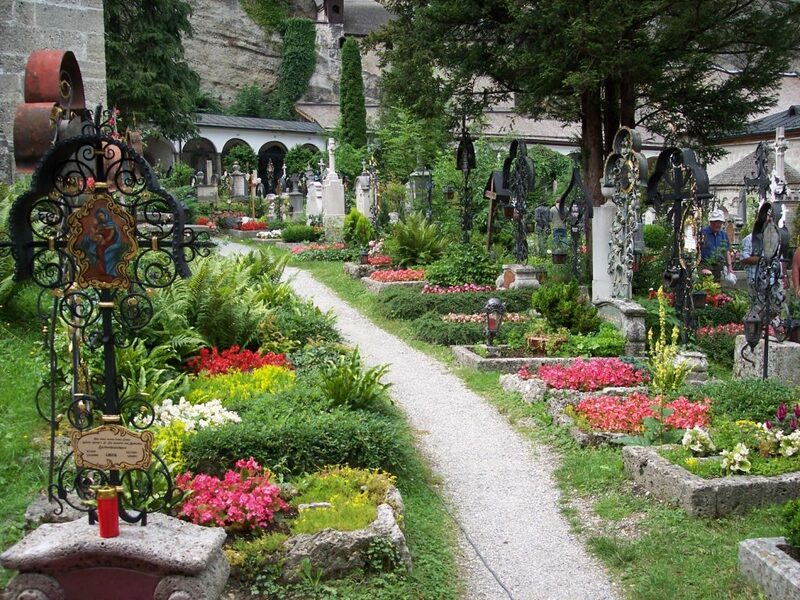 Ordinarily, I would not consider photographing cemeteries, but this one was actually treated as a tourist attraction. This cemetery is important because of the many important people buried there, but I found it fascinating because of the elaborate monuments. 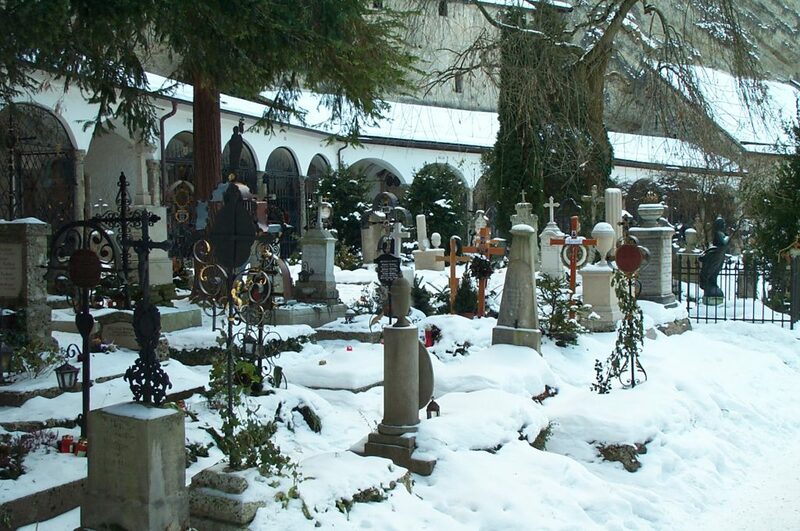 Many of the crosses visible in this photograph were works of art, some having an enameled painting of the individual or some scene included on the cross. The columned backdrop included massive monuments built into the rock, presumably for the wealthy families and/or noble deceased. Of course, there was a lot more to St. Peter’s Abbey than the stuff about dead people. St. Peter’s Abbey church looked plain and simple old stone from the outside compared to other churches in the city, but the interior was fabulous — bright white with extraordinary artwork all around. It still had its Christmas decorations up, with Christmas lights strung up in tree-shaped formations along each side. Engulfing the church was the Bishop’s Residence, a relatively plain but massive square structure about the size of a city block. The Residence was gorgeous with its yellow trim and red sandstone facade, and the huge bright blue emblem over the visitor’s entrance. I found it interesting how the spire of the Church towered over the Residence, making the architectural differences appear to clash. Admittedly, this is a very abbreviated tour of the Castle and its immediate environs. Again, I hope to return there, preferably in the summer when there would be a lot of people about. 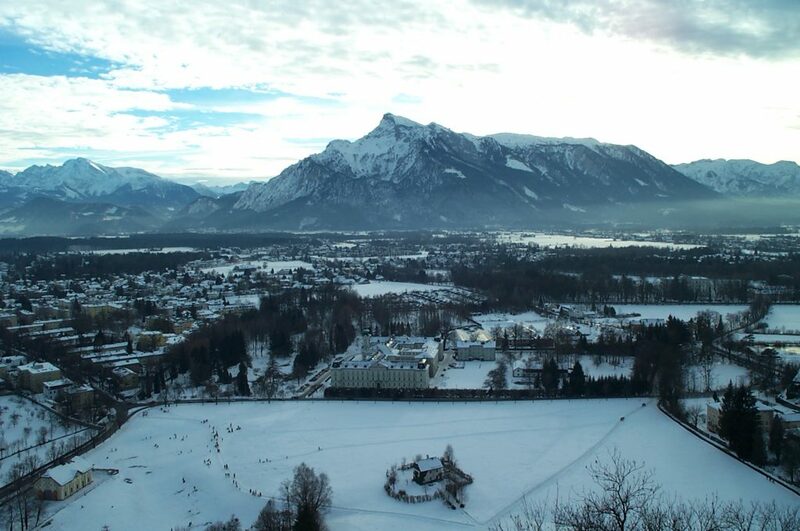 While Salzburg does have a lot of activity in the wintertime, I venture that most of the activity was related to the ski slopes and not in visiting this beautiful attraction.